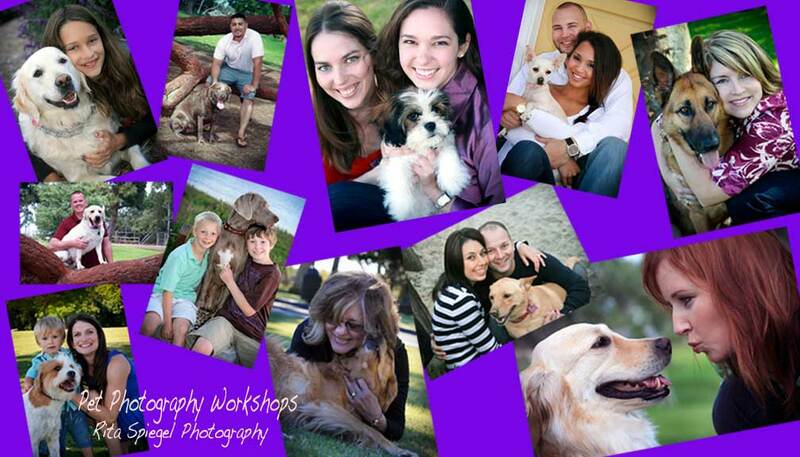 Rita Spiegel Photography: September Pet Workshops ... room for more! For dog owners, their dog's a member of the family; so of course, they need to be part of the family portrait. You'll create your own individual and special picture of your dog. You don’t need to be a photographer. Whether you use your camera phone, a point and shoot, or a SLR; you've learn on how to pose your pet, various “points of view” to take the picture, backgrounds, formal and informal positions, props, costumes and when/how to use treats. We'll review lighting, composition, the rule of thirds / and depth of field and F-stops. These are important basics of photography. We will cover when to use "the rules" and when to break them for better photographs. The group is limited to ten participants, so you will get plenty of personal instruction. The workshop will be held in the North County (Oceanside) and your dogs are invited to attend.Only $84 Limit on only 10 students per class. Your dog must be well mannered and have all their vaccinations. Only $84 Limit on only 10 students per class. Individual and/or group workshops can be arranged. Please contact me if you are interested.